Trikes and (odd) bikes. : Monday 5th March 2018. Spring is cancelled, rescued and cancelled again. Monday 5th March 2018. Spring is cancelled, rescued and cancelled again. Monday 5th March, 29-36F, -2+2C, gales and slightly misty with fine snow falling on 4" of new, overnight snow. To add to the fun, it seems that loadza dosh, Sky and its multimillionaire, non-inhaling team members are now alleged to have fallen off their bikes so regularly simply to hide the needle tracks with scar tissue. Dare we hope for the removal of all winner's trophies and medals to a place of safety? No, NOT the UCI nor the Olympic Committee. No morning walk, so spent hours clearing snow with a large plastic snow shovel and wheelbarrow. It turned to rain just after 12am. Choking on the neighbour's recycled, industrial strength, pallet smoke, again, for most of the morning. It continued to thaw and to rain steadily in the afternoon with little real sign of snow depletion. Tuesday 6th 32-43F, 0+6C, thick mist, overcast and still at 7.30am. National warning of icy roads. 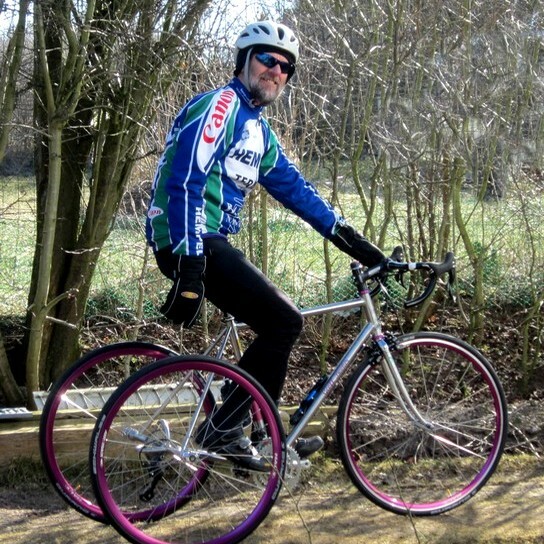 I have been getting painful knee and hip twinges after a lack of cycling during the wintry weather. It may also be due to walking on very lumpy and snow covered fields. There is only a short period when I can enjoy new vistas. So I have been taking advantage while no damage can occur. It is only now that walking on the [hard frozen] clayey soil does not result in huge "diving boots" of mud. My Ecco walking boots are getting near their "use by" date. With the heels chamfered completely away, the toes turning sharply upwards and cracks appearing between the various panels. They only cost me a fiver in a charity shop. So have paid for themselves hundreds of times over. They looked brand new on the shelf but had the insoles missing. I just moved my old Salomon insoles over and started walking. The Eccos have felt far more comfortable than the two pairs of Salomon boots. Both of which had started leaking copiously in wet grass within a year of purchase and within the guarantee replacement. The Eccos have never leaked despite their now decrepit appearance. The Eccos do lack some ankle support compared with the taller, stiffer and heavier Salomons. This is an important factor when crossing hard frozen, ploughed fields. Not so much the danger of injury but it can be painful to have one's feet regularly twisted in all directions due to the complete lack of flat surfaces. I was reading some idiot's opinions about wearing lightweight trainers for all off-road walking while carrying a pack. He was denying there was any need for ankle support or waterproofing. He claimed he goes thousands of miles each year. It must be the wrong leaves on the trails in the US. He obviously never walked anywhere in Snowdonia or even lowly Denmark during the winter. Wet feet are cold feet which rub however the dampness is achieved. Pain is pain however self-inflicted. This morning, there was still enough snow to allow me to take shortcuts across the fields to reach the woods. Then to skirt the edge of the forest beside dozens of animal tracks. An eery mist hung around the bare trunks of the beeches as I climbed. Drifting had occurred beside north-south hedges where low gaps were open to the easterly wind. Leaving a series of ridges and corrugations across the track more than three feet deep in places. Soil had been lifted too with brown, dusty coatings lying on the pure white of the snow. The roads were damp but not icy underfoot on the walk back against the traffic. Allowed out for a shopping ride in bright sunshine. Returned heavily laden. Only 7 miles. Wednesday 7th 32F, 0C, light winds, heavy overcast. The ground and the puddles were frozen again. As were the village ponds. Small groups of mixed finches were busy in the hedges. The Goldfinches looking gorgeous in their Sunday best. Snow or sleet are forecast for the whole day. Moving up from Germany, start time is optional depending on one's optimism. It didn't happen.